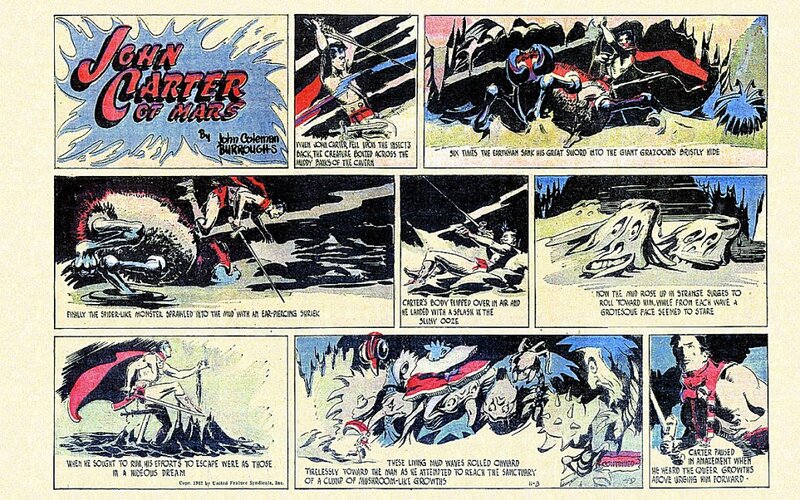 P1: When John Carter fell from the insect's back, the creature bolted across the muddy banks of the cavern. P2: Six times the Earthman sank his great sword into the giant grazoon's bristly hide. P3: Finally the spider-like monster sprawled into the mud with an ear-piercing shriek. P4: Carter's body flipped over in air and he landed with a splash in the slimy ooze. P5: Now the mud rose up in strange surges to roll toward him, while from each wave a grotesque face seemed to stare. P6: When he sought to run, his efforts to escape were as those in a hideous dream. P7: These living mud waves rolled onward tirelessly toward the man as he attempted to reach the sanctuary of a clump of mushroom-like growths. P8: Carter paused in amazement when he heard the queer growths above urging him forward. CHAPTER 49: "A WILD RIDE"
Of all the places in a world that John Carter might just then have elected to visit, the belly of an angry venomous grazoon ranked at the very bottom of the list. As quickly as his earthly muscles could respond to the shocking development, he attempted to leap away from the terrible thing. But the monstrosity's silken capture-line held him back and the Earthman was only partly successful in his struggle. He managed to jump as far as the outer edge of the creature's underside and there he toppled over the side. His momentum and weight provided exactly the amount of counterbalance the grazoon required to right itself. Flat on his back and entangled in the adhesive strand, the man gazed up at the monster's approaching pincers. Captain Carter fumbled for his long-sword and then, to his despair, he realized that it was pinned down by his own weight under his backside. Woola whimpered unhappily in protest but he obeyed Sola's command to stay back from the two glass-encased figures. Eventually the brute ran off among the forest undergrowth and stayed out of sight for a considerable amount of time. When he returned it was with something strange between his toothy jaws. "Let me see what you have there, you silly hound!" Sola scolded. "Oh -- you've gone and uprooted a clump of man-flowers! Here, give them to me; this isn't a proper meal for a big mean calot like you!" The green girl carefully unfolded the mangled plants. Woola's hard tugs had bent their arm-like branches, serrated leaves and strangely patterned petals, but they were tough little things and the handful of insect-eating flowers did not appear to be greatly injured. Sola used her dagger to carve out a few holes in the forest floor. She transplanted the wilted weeds near the sleeping man's head and gave them no further notice. Now it was the old grazoon's turn to misstep. The spider-like creature lurched down to puncture its prey and inject a copious measure of poison, but it too was entangled in the line and the grazoon's lunge missed John Carter's throat by a handbreadth. That was all the advantage the warrior needed. He rolled over twice in the thick mud of the cavern floor and sat up in the slimy ooze, long-sword in hand, while the grazoon was tearing at its own silk. Where another, less experienced fighter might have stooped to rub the muck from his eyes and look for a path of possible escape, John Carter lunged out to meet the peril of inhuman death head-on. Six times the Earthman sank the great Orovarian blade into the giant's bristly hide. The spider-like monster sprawled into the deepening muck, but one strand of silk still joined the grazoon with its human attacker. In mud up to his shoulders now, John Carter reached out and slashed into the creature's great peering eyes. The grazoon split the cavern's silence with an ear-piercing shriek, the silk broke and the creature was gone. Twice before, in his recollection, the Virginian had found himself feet down in deep mud or quicksand. From those critical experiences he had learned that his only way out of the morass was to lower his head into the blackness and flatten out his body as best he could. The Earthman half-swam and half-crawled through the thick stuff until one knee finally touched bottom. Then the mud rose up on three sides, in strange surges that propelled him forward -- forward in the sense that he moved in a direction of greater light and a lower rock ceiling. The waves of ooze continued to roll in, from the right as well as the left, and from each wave a grotesque face seemed to stare out at him. The depth of the ooze had diminished to the point that the mud-spattered warrior could move unsteadily through the stuff on two limbs rather than four. He rose to his feet, a dirty shadow of his former self. "The spider disappeared so quickly." he thought out loud. "That seems strange. I suppose I should be thankful it is gone -- that there was only one of them. But -- it still seems unnatural. No, more than that; it seems unreal!" John Carter continued to stagger toward the light, climbing over slimy boulders and wading through pools of black viscous material which was neither liquid nor solid. His progress was slow -- frustratingly slow. He lifted a foot to move forward and took a dozen breaths before he felt it touch bottom again. Then he lifted the other foot and it too passed through the muck as slowly as a snail on a cold spring morning. When he sought to move faster, his efforts to escape were as those of a man caught in a hideous dream. "This can't be real," he said to himself. "Not even on Mars does mire come alive!" Still, the living mud waves rolled onward tirelessly battering him from all sides. Where before there had been nothing but slime, muck and rocks the Earthman now stumbled over dead roots and broken branches. The light continually increased overhead and now John Carter could see that the rocky ceiling had given way to dense vegetation. Ahead of him sunbeams pierced the canopy of foliage and he could make out the shapes of huge mushroom-like growths. Twice he fell to his knees and had to tear away twisted roots, hidden amid large piles of decaying leaves, in order to move on. But when he reached the giant mushrooms the ground was at last clear of the tangled debris and firm enough to support his weight. Glancing over his shoulder he beheld the living darkness of the cavern, forming distorted faces and clutching hands. The animated gloom was calling him back in hypnotic, enticing surges. John Carter felt the strong pull, like a thumbtack in the attraction field of a powerful magnet. He hesitated and wavered. Then the weary fighter heard the queer growths in the foliage above urging him forward out of the blackness. The unexpected sight so startled the green girl that for a moment she simply sat and stared. Then it happened again. For the first time since she had seen the Jasoomian stretched out upon the slab in Vovo's tower, he had moved. The first motion she saw was but a slight twist of the man's neck. It came and went so quickly that the daughter of Tars Tarkas could not be certain that her eyes were not playing tricks upon her. But that small spasm was soon followed by a more obvious backward jerk of his chin. The second event was an undeniable fact. John Carter's muscles had moved of their own accord and that must signify something. But what? Following the stiff lurch of his head the Jasoomian returned to his former motionless state and the man's entire body went flaccid. "Oh! Dotar Sojat -- have you died!" Sola cried out. Then she recalled Oman's warning about not disturbing the dreamers with loud sounds and she lowered her voice. "I fear I have lost you now, man of another world. Is this my punishment for taking you away from the robot's safekeeping?" Just then an alien thought sprang from out of nowhere and reverberated within the green girl's telepathic consciousness: "I yet live!"